L-R Bacolod Negros Occidental Federation for Information and Communications Technology (BNEFIT) President and HYBrain DevelopmentCorporation CEO John Dave Duenas, BNEFIT Founder and Executive Director Jocelle Batapa-Sigue, Ethereum World - Singapore official Chris Thompson, DynaQuest Technology Services President Randy Knutson and Ethereum World President Daniel Adams at the Bacolod Blockchain Initiative. Industry practitioners see blockchain as a new technology that Bacolod need pioneer to enhance its lead as a center for excellence in information technology and business process management amidst the threats of new disruptive technologies. Last Thursday, May 24, blockchain industry practitioners and local stakeholders in Bacolod converged for an intensive whole-day workshop about block chain technology, dubbed as Bacolod Blockchain Initiative at the Carlos Hilado Memorial State College – Talisay Campus. The focus of whole day workshop was on the use of blockchain in smart contracts and healthcare, particularly electronic healthcare records and its integration in the academe. 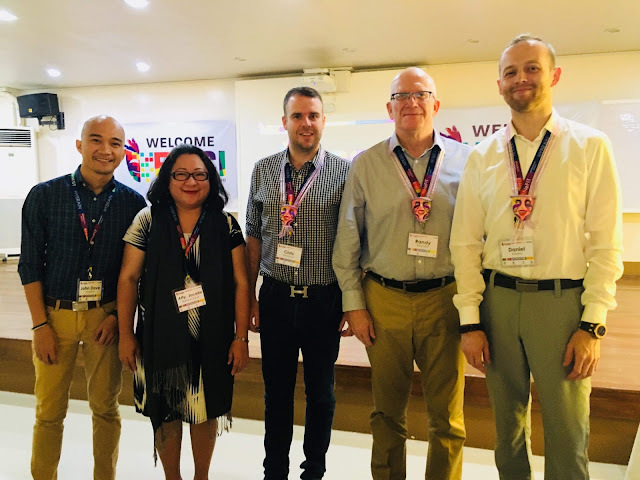 The Bacolod Negros Occidental Federation for Information and Communications Technology (BNEFIT), organized the project with the support of Ethereum World, an incubator based in Singapore, DynaQuest Technology Services, a Manila-based firm, and HYBrain DevelopmentCorporation, a Bacolod-based software development firm). BNEFIT president John Dave Dueňas, also the founder of HYBrain said Ethereum World has invested in the best technology to provide executive services catered to all entities to help all visionaries expand their business ideas and discuss with our team of top developers and advisors. The main aim of the initiative is to introduce blockchain technology which has been in mainstream media because of the popularity of one of its application known as “cryptocurrency” but Dueňas says, blockchain is more than cryptocurrency, it is a technology which introduces a new wave of “internet”, secured sharing of data and effective integration of data amongst processes which is now being referred to as the software development technology of the future. Only a few countries like the United States of America and the United Arab Emirates have actually included blockchain technology in their academic curricula, so when Ethereum World, a blockchain integrator company based in Singapore showed interest in introducing the technology in Bacolod, BNEFIT has to grab this opportunity in order to open the doors in the province and the city to explore the possibility of being the first location in the Philippines which has academic institutions incorporate blockchain in their elective courses, he added. The workshop will be facilitated by Knutson together with Daniel Adams, the chief executive officer of Ethereum World, and Chris Thompson, Business Development Director also of Ethereum. BNEFIT Executive Director Jocelle Batapa-Sigue said this project is a big boost to the iTEACH program of BNEFIT which is composed of a series of industry-led digital workshops for the academe. We only have a few more years, before new technologies create major disruptions to the workplace and Bacolod needs to constantly step up not only to maintain its lead among BPO locations in the Philippines but to take advantage of the millions of new digital jobs available around the world, Sigue added.